Your pet rabbit is an extension of your family. As such, you naturally want to make your bunny feel as at home as possible. Pamper your cuddle buddy while ensuring his habitat is safe and healthy with do-it-yourself bedding solutions that are easy on the wallet and pet friendly. Before you create a rabbit bed, keep in mind that your rabbit will chew on anything, whether the materials are good for him or not. The materials you use to construct the bed out of should be all-natural. Synthetic materials, such as pillow stuffing or polyester, can give your bunny a tummy ache. Use materials that you can easily and inexpensively replace or recreate, since your bunny will likely chew up his new bed. In nature, rabbits sleep in nests lined with twigs, fur and dried grass. The materials they use are not only easy to find but are good insulation against cold and can easily be pulled apart and re-created as the rabbit needs to enlarge his home for a family. He can burrow into the nest to escape the eyes of predators or add to the nest to keep moisture in the muddy ground from seeping into his fur. Your bunny will feel more at home if his bed reminds him of nature. He will be happy if you provide him with a bed of mulch, straw or wood shavings. Ensure he has enough natural bedding that he can burrow down into the materials for warmth and a feeling of security. Keep enough extra materials on hand so you frequently change out his bedding for fresh. You may even want to add leaves from the backyard. 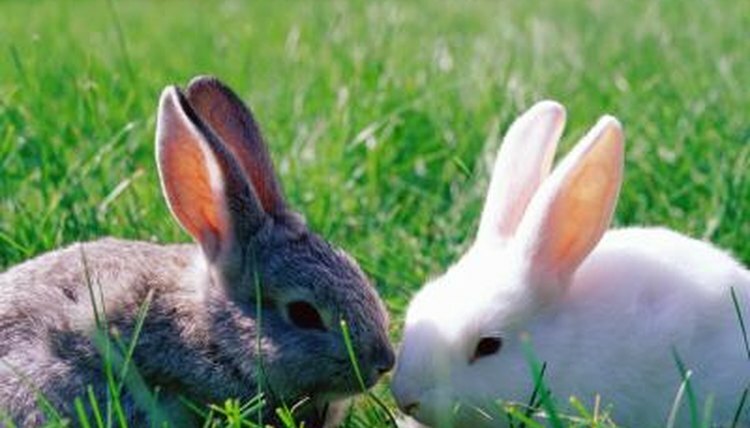 Rabbits are curious by nature and will appreciate the scents carried in the leaves. If your bunny is not prone to chewing material, you can create a pillow bed for your pet. Use a natural fiber cloth that has not been dyed, such as sheepskin or canvas. Cut the cloth into a shape and size that will easily fit into the rabbit's cage. Sew up three sides of the cloth with the right sides together. Turn the right sides out and fill the pillow with cedar shavings, then stitch the final side closed. Avoid overfilling the pillow. You want your rabbit to be able to jump on it and to be able to rearrange the shavings within the pillow easily. Ensure that the pillow is far enough away from the rabbit's food, water and litter box to keep the bunny from soiling his new pillow inadvertently.